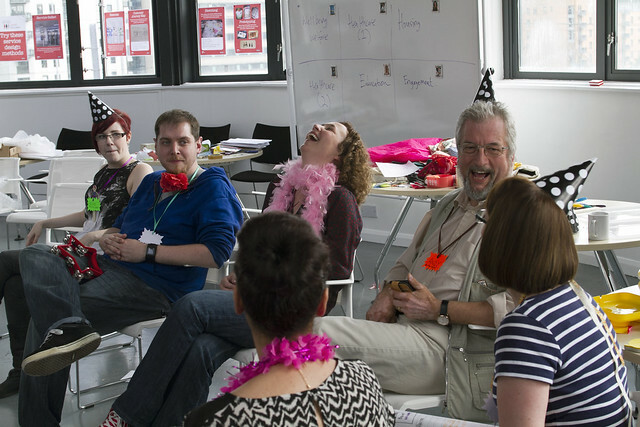 We’ve had a couple of lovely write-ups from last week’s Govjam. Jammer Rebecca Williams and Team Member Lisa Jefferies (who also took many great photos of the Jam) wrote about it on the Tunstall blog. So what did we learn? Well, first up, we learned about the importance of playfulness in eliminating fear in teams. We were inspired to try new approaches, to work in new ways and to ‘fail fast’. Ideas blossomed and became real through prototyping. And teams were actively encouraged to take their prototypes outside of the building, to test their ideas (and assumptions) on others, and to invite challenge from ‘customers’. Crucially, the time constraint of the two-day event meant that teams had to keep moving and iterating their concepts at pace in order to improve them. Any organisation can learn from such an approach to service design. What value was gained from the day? * Ideas, improvements, concept development and communication on a local or global basis can be achieved in very short time frames and with simple tools. * That by imposing shorter time frames, project decision making be- comes simpler and more direct with less need for meetings. * Available resources can be adapted rather than always using new ones. * Any colleague at whatever level can do this. I was chuffed to bits the event went so well, as did the rest of the team running the event. What’ll be interesting for me will be what the attendees do next, and hopefully those guys will report back at some point in the not-too-distant-future about how some of the GovJam spirit has helped them within their services! Thanks to Lisa, Rebecca, Andi and Si for their write-ups. If you’ve written about Leeds GovJam, please let us know! This entry was posted in GovJam and tagged experiences, govjam.